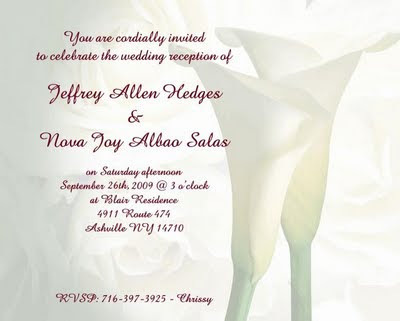 As I have mentioned on my previous post that my mother in law is giving us a wedding reception although it is a year after we got married. I don't mind it, things comes up not so good in the early months of this year so we prefer to make sure that things are okay before we decide to continue. Anyways, I finally made my own wedding invites just to be simple and fancy. I showed it to my in laws and they love it. So, it is also time to show my work here to share with my blogger friends. wow im hapy for you. sis, u know this was the church wedding date of i and my exhubby. So it's only for the reception...kala ko you're going to get married again. Kamusta ang buhay ng buntis? Haven't seen you in a while....hope to see you around.